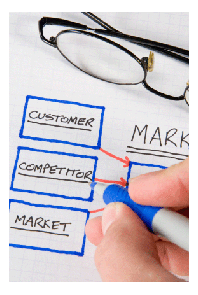 Your business plan is the foundation of your real estate marketing plan. Without a business plan, there are usually only vague goals and little understanding of what you are up against. Without knowing where you want to go, how can you plan the direction to get there? Business Plan -- Do you have one? If not, write one. My advice: Be thorough, but keep it simple. Keep it real! Many well written plans end up collecting dust bunnies because they are too complicated to implement. This is not a dream document. It is how you foresee your business developing over the next year and how you intend to make that happen. Be completely honest with yourself and realistic about your expectations and capabilities. Your marketing plan is the foundation for all your marketing efforts and built around the goals set out in your business plan. The research and analysis done to create your business plan are also used to develop the strategic approach to fulfilling the established goals. In the end, your marketing plan should be firm enough to act on, but flexible enough to accommodate your growth in the industry, any changes in your marketplace, and what is or is not working. It is common to skip from section to section as you are reviewing the information you’ve gathered to help complete this document. As you consider the parts for one section, the information will guide you toward additions into other sections. Follow your train of thought to cover all the details. You can organize it later to improve the flow. Write, rewrite and rewrite your plan again until you have a clear, concise document that truly represents your business. This process can take several hours or several days, but it is worth it in the end. This section, although being the first part of your real estate marketing plan, is written last. It is a summary of the entire plan and covers the main points in as few words as possible. Clear and concise is the objective. This section can be read by an investor to quickly get an understanding of your intentions for the plan without having to read the entire document. You can use this information regularly. Sometimes it’s easy to forget what you’re performing all the day-to-day marketing activities for. You can add the Executive Summary to your day planner so you always have an easy-to-find reminder of your marketing goals. Sometimes, seeing the forest through the trees is all you need to get back on track. Every business needs a mission statement. Answering the following questions can help you find yours. What is your business philosophy? What are your values? Who do you serve? How do you serve the needs of your customers? What sets you apart from your competition? This can give you a firm foundation for your business and plan for success. Moving forward is much easier when you know where your motivation lies. What is happening in the real estate industry? What is the current condition of the market? Use the past to predict the future. Are there any changes in governmental policy that can affect your business? How about in the construction industry? Look at the world around you and review what is going on. If you need more information on historical market data, contact your local, state or national associations of REALTORS®. One or all of these will have statistical data showing the history of your area. Your Multiple Listing Service will have much of the information you need as well. Which segments of the real estate sales market are you going to be working with – i.e. buyers, sellers, investors, commercial, etc? Each of these groups requires a different marketing approach to gain business. The needs, hopes and fears for each group is diverse and the more clearly you understand what they are, the better your marketing results will be. Write a summary for each of your chosen segments about what they want, fear, and how they make their purchase decisions. Analyze your competition. Although all real estate agents are technically your competition, there are a specific few that can directly impact your success. These are the agents you regularly come up against in listing presentations, or that have significant market share in your geographic farm, for example. Look at these agents for this section. Do your research and ask yourself, who are your competitors? How do they market themselves? What are their strengths? What are their weaknesses? What do they offer? How will you deal with objections? Are they competitors in only certain market segments? What is a SWOT Analysis? It’s a fairly simple to perform, heart searching look at your Strengths, Weaknesses, Opportunities, and Threats. It is a look at your current position in the market from a customer’s standpoint in order to find the best approach to overcome obstacles and use your assets to their fullest potential. After writing down your strengths, weaknesses, opportunities, and threats, match the strengths/weaknesses (internal issues) to the opportunities/threats (external issues) that are directly affected or counter the condition. Build a strategy to address any areas of concern from the information. After performing your SWOT Analysis you'll have a better idea of what marketing goals should be set. For a goal to be of value to you, it must have a clearly defined objective, be measurable, and have a realistic deadline. “Making more money this year,” is not a goal. But, selling ten properties or increasing your new customer base by 10% by the middle of the year would definitely qualify. If you can’t find a way to measure your goal – restructure the way it’s written or come up with another. Set long- and short-term goals for both your overall accomplishment and for each of your chosen market segments. Look at the whole picture in relation to your business objectives -- your goals might include sales numbers, an increased profit margin, or customer satisfaction rates, for example. Looking at impact can give you a clear picture of the effort required to make your goals happen, but it also is a great motivator. Motivation can be found in realizing the impact your success will have on you and acknowledging the outcome when the goals are met. Ask yourself, what impact would the achievement of your goals have on your business? How about your personal life? What does this mean to you? Define your offer. What services do you provide? How does your service meet the needs of your customers? Why would someone buy this service? What is your unique selling proposition (how you differentiate yourself from your competition – what you do differently)? This section discusses the actions you will take to deliver your offer of service for each of your chosen market segments. You are developing your marketing schedule in this section. Add details, details, and more details. Messages – What will you communicate to your customers the get their attention? What offers will you make? What service benefits address the fears of this group? What facts will help customers decide to use you? Who are you using to implement this tactic? Are you doing it yourself or outsourcing? Are there any partnerships you can develop to help with time and expense of tactic? Anything else you need to make this happen – mailing lists, email lists, artwork, etc. Where will you get these from? How much will it cost to implement this tactic? What is your marketing budget? Refer to Marketing Budget for more information. What strategies can you afford to implement? Be realistic. You have to know how much money you can spend to best identify the tools and tactics you can use. The information in your real estate marketing plan is for your entire marketing efforts. If you are a listing agent, don’t forget to include information for marketing each listing you intend to get. If your goals are to get 10 listings per year, the budget must include the cost to market each of these listings as well as marketing to get the listing in the first place. Many real estate agents forget the importance of measuring and evaluating their marketing plan success. This is critical, because it serves as the foundation for what to do or not to do in your next marketing year. Plus it identifies how you can improve your plan based on the outcome of your efforts. Monitor Your Results – Track each lead and where it came from. Survey your customers, monitor your website results, etc. Which parts worked and which didn’t. Expectation of Results -- What will you do if marketing efforts are not effective? When is a realistic deadline for results? What corrections can be made? What are acceptable results? At what intervals will you evaluate your success? Refine Your Approach --Throughout the lifetime of your business, you will try many different approaches to acquire business. Some work, some don’t. Some don’t work because of timing, some are simply bad ideas. All of this information should be documented. If you find something that works, try it again during different times of the year – it may be a seasonal success. If so, post it in your marketing plan during that season for next year. There are no guarantees – but keeping your eye on what you are doing puts the odds in your favor. The end… Voila, you’re finished. You might want to re-read and re-write it one more time to be sure. If you’re satisfied with the results of your efforts, you can get started using your marketing plan to build the wildly successful career you dreamed about.